Agartala, January 22: Between barbed wires and border forces, 31 Rohingya Muslims have been stranded on the zero line in Tripura for over two days. The Border Security Forces of India has mentioned that these 31 Rohingya hail from the Rakhine State in Myanmar and have refused to accept them as refugees as there is no breach of line from the Indian side. After their preliminary questioning to know their identities, the BSF said most of them are from four districts of Rakhine State namely Mandaw, Bhusidang, Maungdaw and Manandaw. 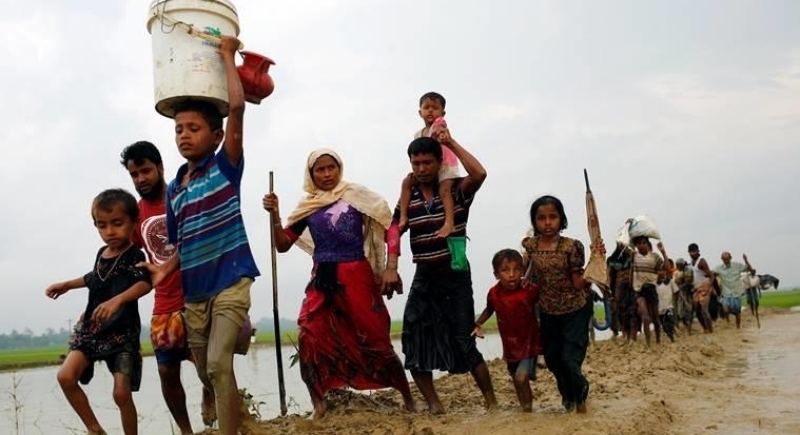 While the Border Guards Bangladesh (BGB) alleged the Rohingya Muslims tried to cross over from India, the Border Security Force (BSF) said Sunday that there was no sign of a breach on the Indian side, which meant the Rohingya could not have come from Tripura. The BSF, which believes the Rohingya may have comes from Bangladesh, has also offered the BGB a joint survey of the fencing on the Indian side to identify a possible breach. The DIG of BSF CL Belwa informed that the questioning is underway and till now they have been reported things like their names, age and also their route of journey are yet to be confirmed. So far, it has come to the notice that they are from Myanmar. The questioning will continue tomorrow. On humanitarian grounds, the BSF have provided them food,water and blankets on humanitarian ground as they are staying in the open. They are yet to receive instruction from Delhi about this matter. The 31 Rohingyas, including 16 children, were detained by Border Guards Bangladesh (BGB) on January 18 and alleged that the BSF has been pushing them back to their country. The BSF has denied the blame, saying that there is no breach of fence on the Indian side. In their counter reply, they accused the BGB to push them to the Indian side of the international border. The ministry of Home Affairs ordered all the state governments to identify and monitor Rohingyas in 2017. In 2018, around 62 Rohingyas were detained in Tripura.